Hot stone massage is a deep healing and unique massage. It involves the application of water-heated stones of varying sizes to key points on the body, giving a deep massage and creating sensations of comfort and warmth. 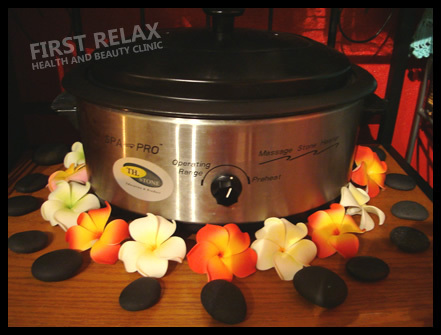 The direct heat relaxes muscles, allowing manipulation of a greater intensity then with regular massage. Also frozen, cooling marble stones are used. This helps the body detoxify and heal. The alternate sensations of hot and cold cause your blood vessels to constrict and expand, pushing blood and any unwanted waste products through your body. Every cell in your body receives oxygen and nutrients while at the same time waste material is moved more effectively through the corresponding increase in lymph flow. The penetrating heat from the basakt stones is deeply relaxing alternating with the marble stone refreshing coolness. The use of extreme temperatures has long been scientifically and medically proven to benefit the body. If you experience a hot stone massage you will notice a healing improvement of the following symptoms.